I just had to write to you and commend the services of one of your wedding planners, Sara Portello. 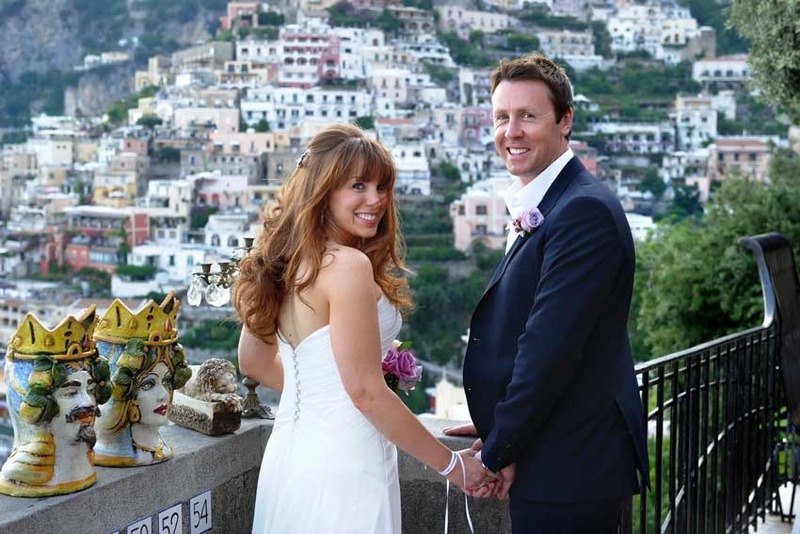 Sara helped us plan our dream civil wedding in Positano on the Amalfi Coast on 27 July 2012. From start to finish, Sara's service delivery was outstanding. When we first contacted a number of wedding planners about getting married on the Amalfi Coast, Sara's response stood out. She was helpful, informative and had great ideas. Unlike other planners, we felt she wasn't trying to "sell" a wedding to us, rather she genuinely cared about what we wanted and tailored her suggestions accordingly. Our wedding day was everything we had hoped for and more! From the gorgeous ceremony venue of the Positano Town Hall to the fun and fabulous reception at Le Terrace, the entire day ran smoothly and without any complications. The flowers were simply amazing, the violin player outstanding (I am so glad Sara recommended him), the car service impeccable and the assistance with the paperwork in Rome a seamless experience. Our photographer, Massimo, also did a wonderful job. We were astounded by the quality and creativity of the photos - he managed to capture the day so perfectly! Special mention has to go to the divine girls at the Positano salon of Luisa & Flavia - they did the most amazing hair and make up not only for my bridesmaid and I but also for our other guests. We felt so welcome and were treated to first class service. Nothing was too much trouble and we had such a fun time enjoying their hospitality in the lead up to the ceremony! And the ceremony... what a beautiful and touching service it was due to the wonderful Giovanna D'Amato. All our guests commented on how warm and genuine she was and that she truly made the service an event to remember! Thank you Giovanna for your kind words - you made such an impression on all that attended! But finally, back to Sara - I cannot recommend her services highly enough. We just wanted to thank her for making our wedding a dream come true and cannot put into words just how thrilled we were with everything. Thank you Sara for helping to make it the best day of our lives - we will never forget our special day in gorgeous Positano!